4 rollers hydraulic cylinders. Veneer from 2,100 mm. up to 4,100 mm., Pre-bending thickness from 4 to 100 mm. Rollers diameter from 1000 to 1050 mm. Minimum diameter to obtain from 1.5 to 3 times the upper roll diameter. 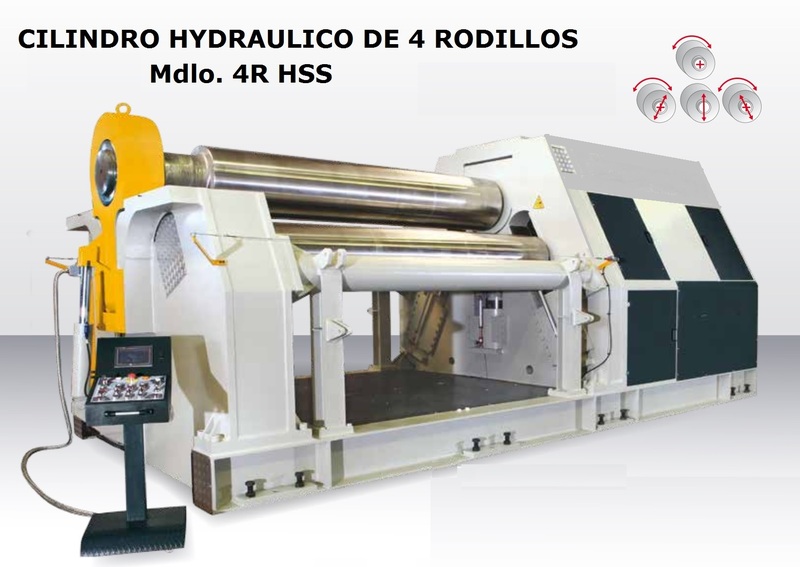 depending on the thickness and diameter of the upper roller Device equipped with cones, induction hardened rolls, Digital display, all the rollers are mounted on bearings, Separate control panel, motion and adjust the parallelism of the rollers controlled from the control panel, hydraulic and electrical protection against overload. 3-cylinder motor roller With initial curve veneer from 1,050 mm. up to 2,050 mm. Pre-bending thickness from 1.5 mm. to100 mm. Roller diameters from Ø70 mm to Ø1050 mm. Minimum diameter to obtain 1.5 times the diameter roller. Cones device equipped with pedals, remote control Cable perimeter security and emergency stop. Easy removal of the material after opening by lateral bending of the upper roller. 3-cylinder motorized rollers with initial curve, Veneer from 1,600 mm. up to 3,100 mm., Pre-bending thickness from 3 to 7 mm. Roller diameters from Ø140 to Ø200 mm., Minimum diameter to obtain 1.5 times the diameter roller. Motor power from 2.2 to 4 or 5.5 kW (depending on model). Device equipped with cones, induction hardened rolls, Upper and lower rollers driven by electric motor-brake system Planetary gear for a perfect result Separate control console with pedals, Cable security perimeter. Easy removal of the material after bending through lateral opening of the upper roller. Up / down power rear roller. Asymmetrical design for a perfect pre-curved. 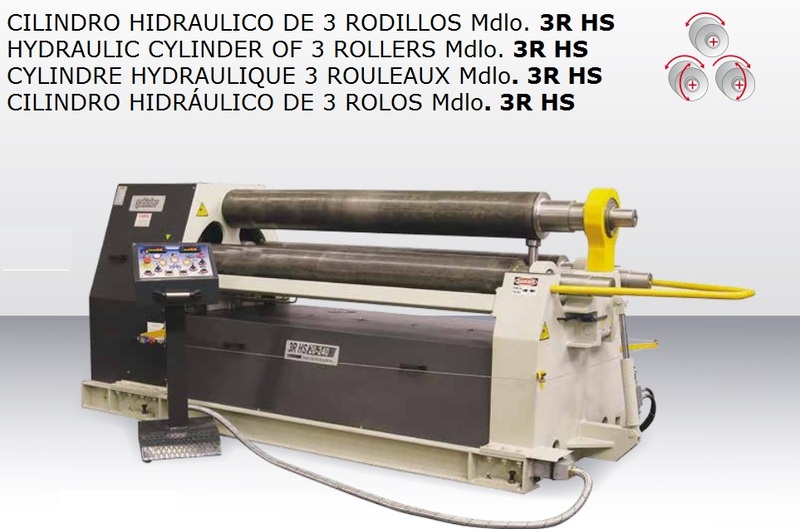 Motor Cylinder 3 reels Mdlos TR With initial bending, sheet metal from 1,050 mm. up to 2,050 mm., Pre-bending thickness from 2 to 4 mm. Roller diameters from Ø110 to Ø140 mm. Motor power 2.2 Kw. Device equipped with cones, Motor car brake, top and bottom rollers motor-driven electric brake and gear system for a perfect result Separate control console with pedals, Cable security perimeter. Easy removal of the material after opening by lateral bending of the upper roller. Up / down manual rear roller wheel. HAND ROLLS OF 3 ROLLER AND SMALL THICKNESS ONLY UNTIL 3 mm. 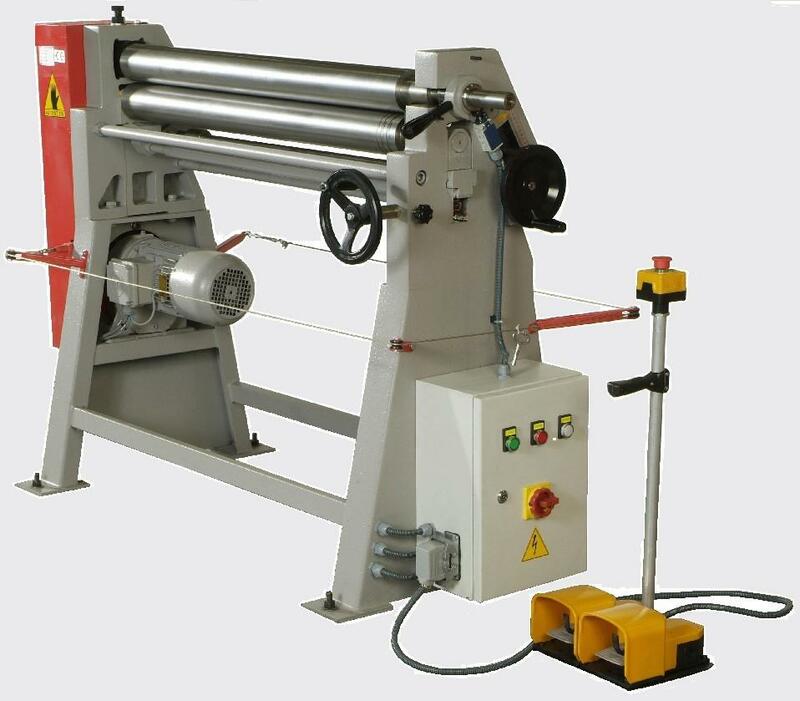 3-cylinder manual roller With initial bending, sheet metal from 1,050 mm to 2,050 mm., Pre-bending thickness from 0.8 mm to 3 mm. O46 mm roll diameters from Ø95 mm up. Minimum diameter to obtain 1.5 times the diameter roller. Model 108 TS (1.050x0, 8 mm.) desktop machine, with bed rest. Device equipped with cones. 2 rollers driving by a crank, up / down manual rear roller wheel or cam.